Integrating an automatic slip sheet dispenser provides the flexibility, precision, and speed required to fully optimize your palletization process safely and efficiently. MMCI Robotics offers multiple options for dispensing slip sheets directly onto an empty pallet, placing a tier sheet between layers of product and/or placing the slip-sheet on top of the finished load. As with our robotic pallet dispensing systems, we have developed standard sheet hoppers to store the slip sheets along with the end-of-arm tools required to automate the slipsheet dispensing process. 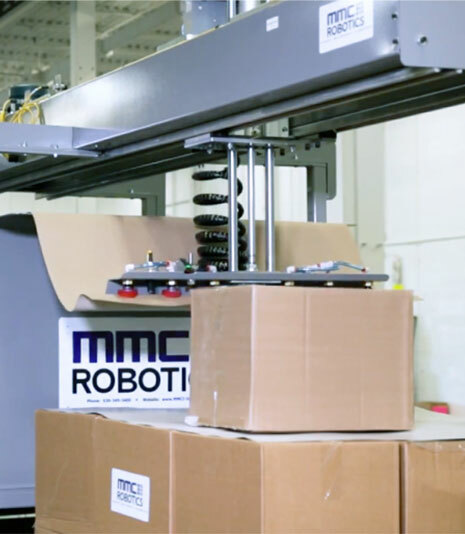 As leaders in the field of automatic palletization, MMCI Robotics developed the SD-30 slip sheet dispenser to provide the flexibility, precision, and speed required to fully optimize the palletization process safely and efficiently. This machine was specifically engineered to address the most common challenges related to placing slip sheets in the palletization process. It holds a wide variety of sizes and is compatible with paper, cardboard, and corrugated cardboard slip sheets. It completely automates the slip sheet process and can even make automatic adjustments for uneven loads. Plus, it is designed to withstand even the toughest industrial environments. The upside-down raceway eliminates dust collecting on the rails, and the bearings feature wipers that clean the tracks as they travel back and forth, making this versatile machine almost entirely self-cleaning. In this example, the SD-30 has been constructed at an ideal height to accommodate fully loaded pallets. However, it can also be deployed at various stages in the conveyor line for placing slip sheets between layers of product or directly on to empty pallets.